Montserrat Publishing, 2011 - 140 p.
A self-study method of learning English vocabulary for advanced students. A new version of More Practical Everyday English, book 2 in the Practical Everyday English series. "Once again I have included dialogue and exercises at the end of each chapter, so that you can see how the words are used in free conversation and writing, and test yourself on what you have studied in each chapter. Like the first book, there are three lessons in each chapter and nine chapters in total. My suggestion is to read one lesson a week and then do a revision after finishing each chapter. I hope you enjoy the illustrations too. When you finish each chapter, you should listen to the CD of the dialogues, which will greatly improve your comprehension of the words and expressions you have studied in that particular chapter. Don’t get depressed if you don’t understand everything first time without the book in front of you. This is perfectly normal. Try again while following the dialogue in the book." 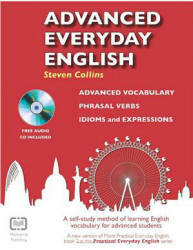 Thank you for buying Advanced Everyday English with audio CD, the second book in the Practical Everyday English series. It is an updated, improved and extended (with sixty new words, exercises and a CD) version of More Practical Everyday English, which is now out of print. It is designed in very much the same mode as the first one (Practical Everyday English with audio CD) in that all oft/he examples will contain vocabulary and expressions you have studied on earlier pages. You will also find many words from the first book, which will give you an opportunity to revise the material. In this second book there is more of what one might call "serious" vocabulary, but there are plenty of phrasal verbs and idioms as well. The book will be of particular benefit to those readers with an advanced level of English who wish to become (or who already are) interpreters, translators or teachers of English, or who simply want to be able to speak and understand English at a very high level. In addition, people who need to read English language journals or converse in English on a daily basis, either in business or for pleasure, will find it very useful. Once again I have included dialogue and exercises at the end of each chapter, so that you can see how the words are used in free conversation and writing, and test yourself on what you have studied in each chapter. Like the first book, there are three lessons in each chapter and nine chapters in total. My suggestion is to read one lesson a week and then do a revision after finishing each chapter. I hope you enjoy the illustrations too. When you finish each chapter, you should listen to the CD of the dialogues, which will greatly improve your comprehension of the words and expressions you have studied in that particular chapter. Don't get depressed if you don't understand everything first time without the book in front of you. This is perfectly normal. Try again while following the dialogue in the book. It is my sincere wish that, together with the first book, you find Advanced Everyday English an invaluable tool in perfecting your English language skills.